BART: Embarcadero station, then take MUNI N-Judah inbound or T-Third inbound to Brannan stop. Caltrain: 4th & King st., then take MUNI N-Judah outbound or T-Third outbound to Brannan stop. microformatsDevCamp! The first ever microformatsDevCamp, for authors, designers, publishers, developers, engineers building pages, sites, and tools with microformats. $20 suggested donation (gets you a t-shirt in the mail). No one turned away for lack of funds. microformatsDevCamp is made possible thanks to the generosity of our corporate and individual sponsors! 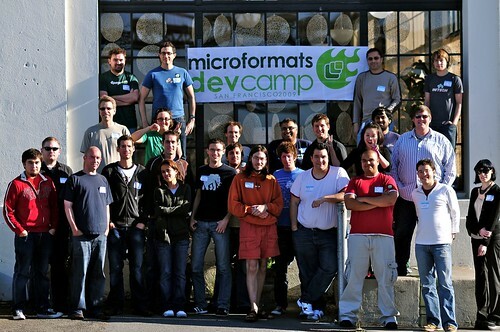 Like all BarCamps, microformatsDevCamp is what it is because of what everyone put into it. It ran smoothly because of all of you volunteers, attendees, designers, coders, and builders. Click on yourself and add a note with a link to your web address! Note your site (with hCard if you have it), interests/projects, and tag yourself as a web author, designer, IA, publisher, developer, UI-tester - pick at least one. Feel free to add your twitter, or other method of contact. Cindy Li - designer. http://cindyli.com, http://twitter.com/cindyli. helping with microformatsDevCamp logo design. done! designed and ordered buttons for event.Done! Chad Weider developer, designer, front-end, back-end, etc. ... please add yourself if you participated in microformatsDevCamp! Outline of schedule for the weekend - more details at the DevCamp! ~midnight+ - day 1 wrap up. As Automattic is donating the venue, as participants it is our responsibility to take excellent care of the venue, leaving it as good or better than we found it. Some amount of camping overnight at the venue will be possible. Suggestions for nearby (easy/quick walking distance) drinks, snacks, food. CheatSheet Translation Brian Suda This is a request to anyone who is speaks another language. I created the PDF cheatsheet awhile ago http://suda.co.uk/projects/microformats/cheatsheet/ if someone wants to translate it into Spanish, or another language, please let me know. I can send the source InDesign file, or if they send me the translations, I'd be happy to update it myself. Please create a wiki page for any hack/project session you lead or attend and link to it from here. See all photos on Flickr tagged ufdevcamp. Blog posts about the devCamp. Newest first. 2009-07-21 microformats.org: microformatsDevCamp this weekend! Chris Messina: What is a DevCamp? microformatsDevCamp is one of several microformats events. Want to help organize and plan the first microformatsDevCamp? Sign up and be sure to pick up a planner role (see below). intro and kickoff - run the introductory session and help start the microformatsDevCamp with traditional BarCamp intros/3tags and explanation of the BarCamp format. food - coordinate / match up sponsors with meals and make sure the meals arrive and are setup for event participants during the event. Drafts a message to send to potential sponsors, follows up leads from others for potential sponsors, collects info, logos (in vector format), and money from sponsors and also sees that receipts (if necessary) are issued at the end. t-shirts - get estimate, make sure to order in time for the event. Ben Ward has done some work on this - check with him. get vendor contact info from Ben Ward who has already looked into this and found a reliable vendor that can deliver high quality t-shirts in a week or less time. Total # of shirts ordered: 100. Size breakdown: Men's: 10 small, 30 medium, 25 large. Women's: 10 small, 15 medium, 10 large. Total cost: $918.00 (would have been cheaper but they had a surcharge for the rush order). I have charged 50% of the cost already to place the order. Other 50% due at time of pickup.